What if every electron in the universe was all the same exact particle? There's an idea that suggests all the universe's electrons are actually one particle forever traveling backwards and forwards in time. It's a simple, elegant idea that solves some of physics's biggest mysteries. There's only one tiny problem. It's complete nonsense. This is the story of that bizarre thought experiment and John Archibald Wheeler, the brilliant, largely unsung physicist who came up with it. Like so much of the quantum world, electrons are strange. What's worse, they're all strange in exactly the same way. Every electron is identical to every other electron. They all have the same mass, the same electric charge, and the same spin. (For more on what these terms mean, check out our field guides here and here.) Electrons are just one of the indistinguishable particles - other examples include photons, neutrinos, protons, neutrons, and indeed most of the subatomic particles. This isn't a trivial point, either. Not only is it impossible to tell electrons apart based on their physical properties, it's essentially impossible to tell them apart at all. This is because determining specific electrons by their position would require measuring their trajectories with exact precision, and the laws of quantum mechanics forbid this. Between measurements, electrons in the quantum world are probabilistic, defined by wave functions that give the odds of finding that particle in any given position. When the wave functions of multiple electrons overlap, it becomes officially impossible to determine which of the electrons was the one that was originally measured. This is all well-established quantum theory, backed up by nearly a century of experimental work. But it doesn't answer the deeper question - why are all the electrons identical? They most assuredly are, but there's no actual reason why they should be. For many scientists, a question like this traipses over into philosophy, at least at current level of knowledge. As far as most of physics is concerned, indistinguishable particles are indistinguishable simply because that's the way the universe is. No further explanation can be advanced, and so far one hasn't really been needed. The one electron universe is, among other things, one of the very few attempts to explain why all electrons are identical. It has its roots in an entirely different form of symmetry between particles, that of an electron and its antimatter counterpart, the positron. The two particles have the same mass, the same spin, the same everything except for its charge. Leaving the charge aside, the electron and the positron are, well, indistinguishable, and in 1940 that gave a Princeton physicist named John Wheeler an idea. I received a telephone call one day at the graduate college at Princeton from Professor Wheeler, in which he said, "Feynman, I know why all electrons have the same charge and the same mass." "Why?" "Because, they are all the same electron!" And, then he explained on the telephone, "suppose that the world lines which we were ordinarily considering before in time and space - instead of only going up in time were a tremendous knot, and then, when we cut through the knot, by the plane corresponding to a fixed time, we would see many, many world lines and that would represent many electrons, except for one thing. If in one section this is an ordinary electron world line, in the section in which it reversed itself and is coming back from the future we have the wrong sign to the proper time - to the proper four velocities - and that's equivalent to changing the sign of the charge, and, therefore, that part of a path would act like a positron." Wheeler had keyed into a basic if bizarre point of particle physics: the direction in which time flowed doesn't seem to matter much at all, and the arrow of time is, in most cases, completely reversible. (It's a bit more complex than that, but this is a topic for another time.) The upshot is that, with a few simple equations, Wheeler could transform an electron moving forward in time to one traveling backwards, and the only observable change would be the particle's charge, which would flip from negative to positive. In other words, an electron would become a positron. As Wheeler pointed out, each electron traces out a unique path through spacetime, which is its world line. He simply connected all the forward-traveling electrons and backwards-traveling positrons into a single gigantic world line, imagining a particle tracing its way back and forth through the history of the universe to become every electron and positron we had ever observed. And that was why all electrons were indistinguishable. The implications of this would be absolutely tremendous. Current estimates suggest there's about 1080 atoms in the observable universe, so let's use that same figure for the number of electrons. (Actually, since the vast majority of those are one-electron hydrogen atoms anyway, that isn't much of a stretch.) The universe is already nearly 14 billion years old, but it will last far, far longer than that, although the ultimate age of the universe depends on which theory of its final fate you subscribe to. Since we're really only going for a rough estimate anyway, let's just use 4.6*1026 years, which is the lower limit for the lifetime of an electron before it decays (assuming it actually decays, which isn't a certainty). So then, if the one electron universe is correct, that single particle has traveled through the universe 1080 times, with each journey taking 460 septillion years, and you can double that for all its return trips as a backwards-going positron. That means, by the end of its journey, the electron is 2*4.6*1024*1080 years old, or just about 10105 years old. That's ten-thousand googol years old. That also means that 99.99% of the electrons in your body, and indeed everywhere in the universe, have already been traveling for over a googol years...assuming this is true, of course. I don't know about you, but I suddenly feel weirdly ancient. It's going too far to call the idea of a one electron universe a full-fledged theory, or really anything close too it - it's more of a gloriously unconventional thought experiment. But that doesn't change the fact that, from a strictly theoretical perspective, there's absolutely nothing wrong with it. Sure, your intuition probably tells you that this is very, very unlikely, but classical world intuition doesn't mean anything in the quantum world. After all, we now take it as read that it's impossible to know the velocity and the position of a particle at the same time, that particles are generally speaking just as happy traveling backwards in time as they are forward, that particles can be entangled so that measuring one will instantaneously affect the other, no matter how far apart they are. These are all deeply weird, yet they're all absolutely true. So why not a single time-traveling electron for the entire universe? The single electron universe falls down on experimental grounds, not theoretical ones. You might have spotted the problem - for a single electron to account for all electrons in the universe, it needs to travel backwards through the universe exactly as many times as it travels forwards. That means, in this model, that there should be exactly as many positrons as there are electrons. We know that that simply isn't the case, and that matter completely and utterly dominates antimatter, which means the one electron universe can't be true. "But, Professor", I said, "there aren't as many positrons as electrons." "Well, maybe they are hidden in the protons or something", he said. I knew, of course, that, at least in our corner of the universe, there are lots more electrons than positrons, but I still found it an exciting idea to think of trajectories in spacetime that could go unrestricted in any direction — forward in time, backward in time, up, down, left, or right. Wheeler did leave himself a tiny loophole there, pointing out that we know electrons far outnumber positrons "at least in our corner of the universe", which leaves open the theoretical possibility that elsewhere in the cosmos there might be all the positrons needed to make up this vast local discrepancy. That, however, goes against the cosmological principle, which is the general assumption that the universe is essentially the same all over and we don't occupy a special or unusual position in it. Technically, that doesn't have to be true, but there's 500 years of physics backing it up, and there would need to be some truly extraordinary reasons for physicists to consider abandoning it. I confess I have always been amused by the thought of the collaboration between these two Americans, as different as chalk from cheese. Wheeler is a refined, patrician man, mild-mannered and impeccably polite. A colleague once said of Wheeler that he is a perfect gentleman inside of which lies a perfect gentleman. Feynman, by contrast, was famous for his brashness, irreverence, womanizing, practical-joking, and bongo-playing. A lifelong academic, Wheeler earned his PhD from Johns Hopkins at just 21 and his first professorship at North Carolina by the age of 24. Three years later, Wheeler moved to Princeton, which has long been the premier center for cutting-edge physics. A gifted and committed teacher, Wheeler continued to teach physics to the freshmen and sophomores long after he had gained international renown, and his long list of doctoral students includes such luminaries as Feynman, Kip Thorne, black hole expert Jacob Bekenstein, many-worlds pioneer Hugh Everett, and dozens more. Wheeler also had a noted way with words, and he coined two of the most famous concepts in modern physics (and science fiction, for that matter). In 1957, his work on general relativity led him to consider theoretical "tunnels" through spacetime, which he called "wormholes." In a 1967 lecture, he made the first public use of the term "black hole", though he always insisted he had heard the term from someone else. Either way, every time we use those terms, we owe John Wheeler a debt of thanks. Often in collaboration with Feynman, Wheeler made many crucial contributions to our understanding of physics. He was a key player in the revival of general relativity as a subject worthy of serious theoretical consideration, which until then had languished as a curiosity unsuitable for experimentation. He worked extensively on quantum gravity and was one of the first to propose that information was part of the fundamental fabric of the universe, which he called the "it from bit doctrine." As with his one electron universe, Wheeler never shied away from exploring strange and unusual corners of physics. Towards the end of his life, he came up with the "Participatory Anthropic Principle", which holds that the universe is actually created by the presence of observers, meaning that all we can observe from the things right around us to the earliest remnants of the Big Bang simply exist because we're around to look at them. Much like his single electron idea, you don't have to believe in it, but it's a fascinating thought. John Wheeler died in 2008, at the age of 96. I did not take the idea that all the electrons were the same one from him as seriously as I took the observation that positrons could simply be represented as electrons going from the future to the past in a back section of their world lines. That, I stole! The suggestion that a positron could be interpreted as an electron moving temporarily backwards in time caught Feynman's fancy, and he found that the interpretation could be handled mathematically in a way that was entirely consistent with logic and all the laws of quantum theory. It became a cornerstone in his famous "space-time view" of quantum mechanics, which he completed eight years later and for which he shared his Nobel prize. The theory is equivalent to traditional views, but the zigzag dance of Feynman's particles provided a new way of handling certain calculations and greatly simplifying them. 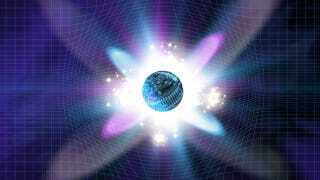 Does this mean that the positron is "really" an electron moving backward in time? No, that is only one physical interpretation of the "Feynman graphs"; other interpretations, just as valid, do not speak of time reversals. With the new experiments suggesting a mysterious unlocking of charge, parity, and time direction, however, the zigzag dance of Feynman's electron, as it traces its world line through space-time, no longer seems as bizarre a physical interpretation as it once did. It's entirely possible that, without Wheeler's bizarre idea of a single electron universe and his 1940 phone call to his doctoral student, Richard Feynman doesn't win the Nobel Prize 25 years later. That's a good lesson to us all, that no matter how strange and impossible an idea might sound, you never know where it might ultimately lead or what great new strands of knowledge it might uncover...well, at least assuming you and your friend are two of the great physicists who ever lived, I guess. Top image by Tonis Pan, via Shutterstock. Particle collision by MichaelTaylor, via Shutterstock. Image of John Wheeler by the Wheeler family.